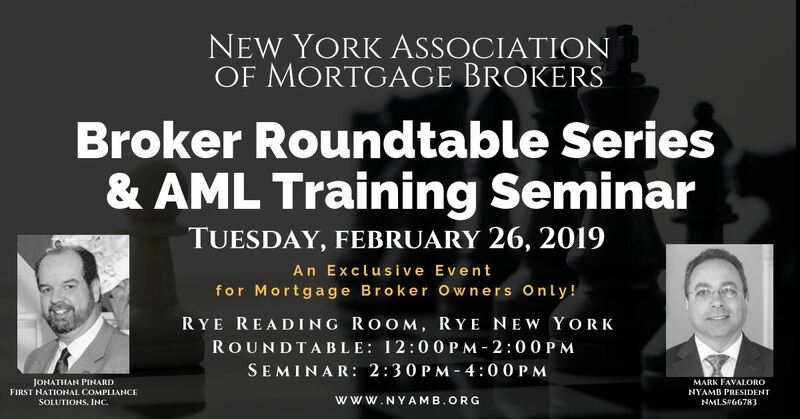 NYAMB Presents its "Broker Roundtable Lunch Series & AML Seminar Lower Hudson Region," an exclusive event for Mortgage Broker owners only, sponsored by United Wholesale Mortgage (UWM), set for Tuesday, Feb. 26 at the Rye Reading Room, 1061 Boston Post Road in Rye, N.Y. at Noon. AML Training Seminar with Jonathan Pinard, Partner, First National Compliance Solutions, Inc. This seminar is designed for mortgage brokers owners (no employees/LO’s) to meet their annual training requirements of their Anti-Money Laundering Policy, as required by The Bank Secrecy Act. This seminar will provide an overview of the required Anti- Money Laundering and Customer Identification Programs, Red flags, responsibilities as a mortgage broker, recent examples of Suspicious Activity Reports and instruction as to how and when a Suspicious Activity Report should be filed. The Anti Money Laundering Rule requires Mortgage Brokers to file reports with the US Treasury that have a high degree of usefulness in criminal, tax, or regulatory investigations including suspicious activity that may indicate mortgage fraud. Click here for more information or visit NYAMB.org.